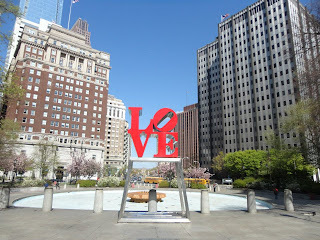 Desperately Seeking Adventure: LOVE Philadelphia! Philadelphia. Some might call it a brand of cream cheese but I'm going to recognise it as a great city. Located in the state of Pennsylvania, another new city awaited my discovery. My days off are precious so I want to use them to the best of my advantage, a nice bit of state hopping is always a great choice. Show me what you got Philadelphia! Let's go! I had an idea what I thought Philadelphia would of looked like, I imagined it to look like colonial with a raw attitude. Parts of Philadelphia fitted that bill but other parts certainly didn't, never-the-less my lasting impressions were positive. One thing that did strike me about this city was the contrast between tourist appropriate areas and not so polished areas. A definite colonial vibe could be felt as I discovered the Old City, but more about that a little bit later on. Like I said my mission is to visit the areas that aren't meant for tourists, because what's so fun about seeing things that are completely predictable? My only knowledge of Philadelphia was the Philly Cheese Steak sandwich that I ate when I was at Orlando International Airport in September 2011. Throughout my day in Philadelphia I saw many extremes but found each of them endearing even the ratchet tones. I look for historical qualities in a place but the devil that sits on my shoulder called 'BB' looks for urban realness. Do you love your hood? Love Philly! Enough of the critical chat I had a super day in Philadelphia, it was super easy to get to from Newark's Penn Station by using NJ Transit and the SEPTA train. Philadelphia's got attitude for sure, so I needed to keep my wits about me. 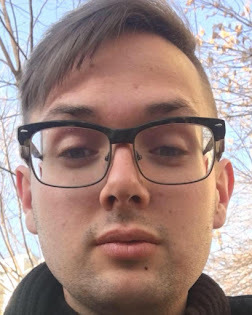 I live in Newark so I'm accustomed to seeing some crazy things going on around me, I'm definitely developing a fierce personality to fit in with these formidable places that I'm experiencing! Philadelphia was waiting for me, I feel that places that aren't completely squeaky clean should be given a chance at least once because like people having different personalities I would say this notion should apply to cities like Philadelphia?! Logan Square was cool and I really appreciated the vibe of Philly's green spaces. 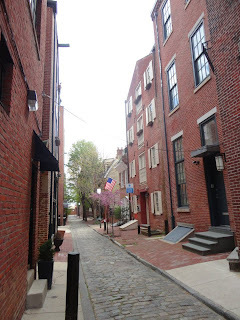 Philadelphia is a city of museums and art galleries but I wasn't interested in seeing those places so I just kept on walking, I covered some serious pavement that day in Philly because I didn't plan on staying over I'm still new to this American travel lark! All in good time girl! I've got this! From the second I stepped of my train at 30th St. Station the walking began, all six hours I'm sure that I accomplished. I had broke away from New Jersey and New York ways to start my crusade of visiting new states that I haven't previously been to before. What I realised is that Philadelphia is a walking friendly city, so much so I felt no need to burden my wallet with the charge of public transport. With the sun-shining my Pennsylvania adventure began. From regal and grand museums to the site of snoozing vagrants, a site that I didn't really care for. 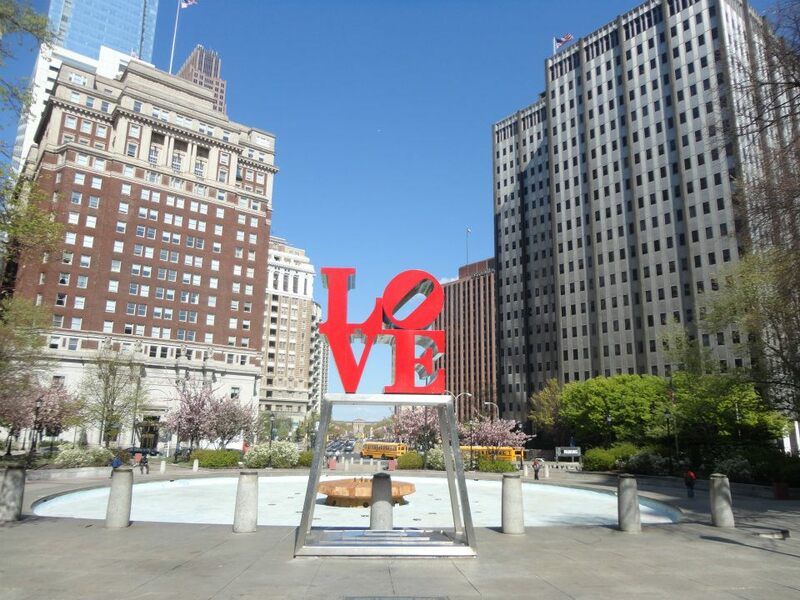 The 'LOVE' statue stood in the perfect place with the blue sky setting the perfect vista. 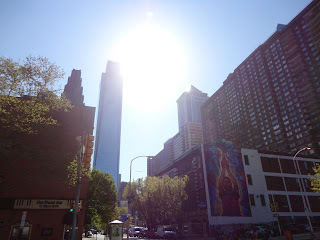 South Penn Square introduced itself in a quirky fashion, Philly's center city showed me its inner core that morning so I popped to McDonald's to grab a bite and I even witnessed some crazies go about their business whilst I ate my breakfast. South Penn Square stands next to City Hall holding no pretenses whatsoever I just went with the flow that morning. Slay! Like I mentioned before I'm not a person who cares to trudge around art galleries and museums but I could of been easily persuaded during my time in Philadelphia. The mile long road that leads to Washington Square gives this city a feeling of cohesion and International kinship. I especially loved seeing the flags of the United Kingdom and Turkey as they are two places I won't be visiting for a long while yet. I actually enjoyed being a part of the action and felt that I could relate to this quite a lot, after all it was only impulse that brought me to this city for that day. Rewinding the clock back to a distant time I checked out the Independence National Historic Park to be acquainted with Philly's past, learning about the Liberty Bell that chimed around 1751 that outlawed slavery in the United States of America. Freedom seems to be a popular theme in Philadelphia for I did love the feeling of Washington Square Park. Knowing nothing about Philly in the first place gave me a sense of just going with whatever I saw. Do it! As I made my way through the different districts the mood changed, the people on the streets changed quite a lot. I found this change quite refreshing so that lightened my view of this city. 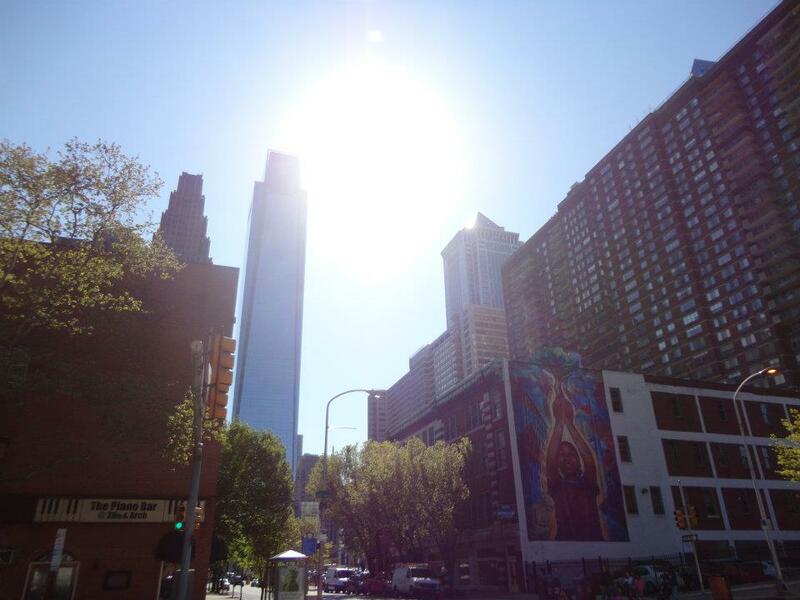 My mind was made that Philadelphia is in actual fact a city that's made of many looks and attitudes. The Old City provided some really interesting and quaint houses that screamed the British had made themselves comfortable here in Philly, the street in the photo that's captured to the right doesn't really scream newly built American condo! Please?! A trendy vibe transcended upon this area, also it was apparent that tourists definitely flock to this area! I did notice that the local's of Philadelphia's Old City didn't appreciate the high presence of cameras, beggars can't be choosers! Look for Penn's Landing to get closer to this Pennsylvanian gem, let's just go with it now! Looking back from the moment I reached the decrepit looking outskirts of this endearing city I don't quite know what pulled it out the bag for me?! I do know that each parts of Philadelphia's center city that I visited gave me a different incite to city life in this Pennsylvanian city. From the main shopping streets which were not quite tourist ready to the squeaky clean borders of the Old City a certain vibe makes me feel like I will be going back to Philadelphia quite soon indeed. I even found a little magazine and bookshop that sold my Attitude Magazines, a Gay themed publication for the modern Gay man that is mainly published in England. I managed to get two issues that I would of missed from home, proving the perfect reading material for the train journey back to Newark's Penn Station. Philly's truly something! Will I go back to Philadelphia? I don't know because I have lots to see in America this time around. Thank you Philly! Gotta Love a Bit of Philly!